The Schluter-Reno-Ramp is designed to provide a smooth transition between a tile covering and a floor covering that is at a lower elevation. The Schluter-Reno-Ramp is particularly useful in commercial applications where wheel carts are used; bakeries, hospitals, garages. 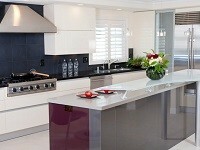 The profile that is available is in the Anodized Aluminum finish. 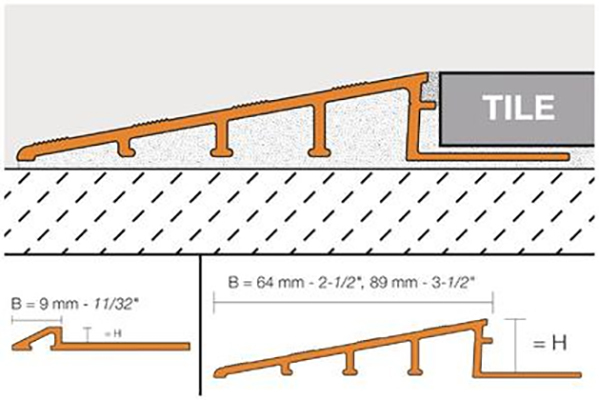 The Schluter-Reno-Ramp features a trapezoid perforated anchoring leg which is meant to be secured in the mortar coat beneath the tile and a 2 ½” or 3 ½” sloped transition that terminates at the height of the tile edge. 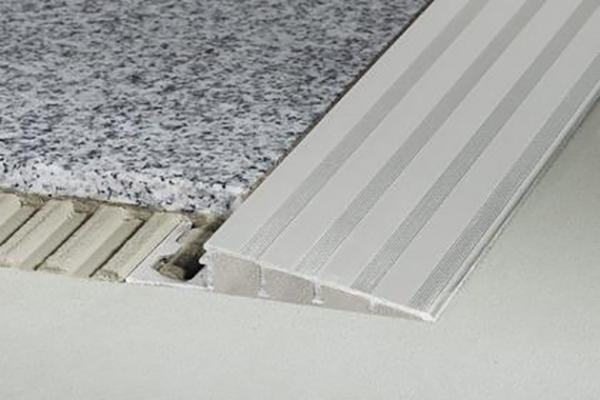 The Schluter-Reno-Ramp profile is meant to protect the edges of the tile and provide a slopes surface to eliminate trip hazards and allow for easy access for anything with wheels. 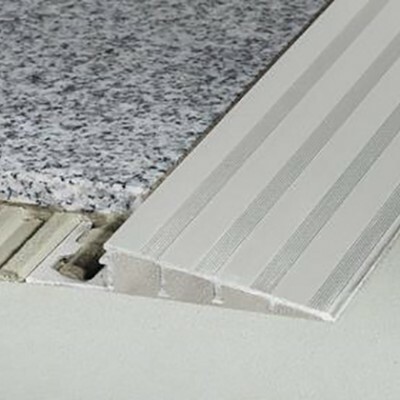 The Schluter-Reno-Ramp in all sizes except the 1/8” features an integrated joint spacer that is meant to establish a defined joint cavity between the profile and the tile. All of the sizes of the Schluter-Reno-Ramp, except for the 9/16” and 3/4” are compliant with the Americans with Disabilities Act (ADA). 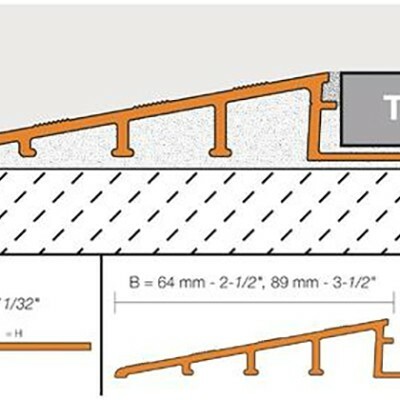 Select Schluter-RENO-RAMP according to tile thickness. Fill the cavity beneath the sloped section of the profile with thin-set mortar. Using a notched trowel, apply thin-set mortar to the area where profile is to be placed. 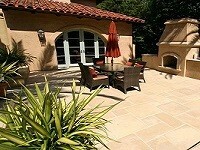 Press the perforated anchoring leg of Schluter-RENO-RAMP into the mortar and align. Set the tile to the integrated joint spacer, which ensures a uniform joint of 1/16″ – 1/8″ (1.5 – 3 mm). The Schluter-Reno-Ramp is available only in the anodized aluminum finish. The Schluter-Reno-Ramp must be tested to verify that it is suitable if chemical stresses are to be anticipated in its required application. When cementitious materials become mixed with moisture it becomes alkaline and therefore may result in corrosion. Due to this, it is very important to remove mortar or grout residue from any visible surface when installing the Schluter-Reno-Ramp. It is extremely important to ensure that the profile is solidly embedded in the setting material and that all of the cavities are filled in order to prevent that collection of alkaline water.